(February 8th, 2018 – Greer, SC) Greer Middle College Charter High School aspires to “build the future” by educating its students to be innovative thinkers and serve their community. In addition to the school requiring students to achieve over two-hundred fifty community service hours by the time they graduate, seniors complete an intense, year-long project or internship to show they have become self-guided learners, effective communicators, complex thinkers, and flexible workers. The senior project or internship is the primary focus for the graduating class, as it takes the place of all of their final exam grades. 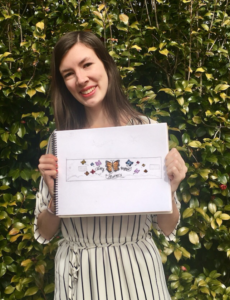 As part of her internship at Greer Relief, Karissa Garzony is taking on an artistic mini-project to benefit the non-profit organization. The “Butterflies of Hope” mural is to be painted in the lobby of Greer Relief. In addition to the inspiring nature of the artwork, Karissa plans to survey various neighbors the organization serves, asking them to use one word that describes how Geer Relief has impacted their future. These words will be added to the mural in dedication of all those the establishment has helped over the years. To complete the project, Karissa hopes to raise $250 to pay for supplies. All funds are collected by Greer Relief and any unused funds will remain with Greer Relief to help neighbors in need. Checks and online donations are accepted. All donations are tax deductible Click here to donate online.